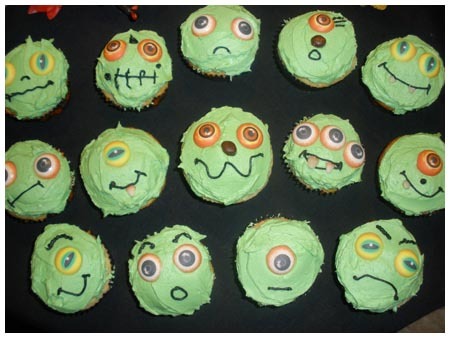 Slimer’s fright night gorey-eyeballs cupcakes. Ah, Halloween. Best night of the year in my humble opinion. Then again, anytime you can leave your house in New York, see 5 zombies, 4 vampires, 7 witches and a bunch of ghosts, tell your friends about it (while you’re dressed as, say, a prostitute) and not be committed to a mental hospital or drug treatment facility is a good night. But I’m just one of those macabre people who loves classic horror movies, witches, and all things black, so why wouldn’t I love Halloween? And hello? Free candy? Does it get any better? I think the way the weather is and the way the stores and houses are decorated for Halloween should stay that way for always. Its just the best. I mean, Christmas rocks too in its own way, but I hate the cold and the snow, and as a non-religious person I celebrate it as “Santa and reindeer and pretty lights” time, which isn’t anywhere near as fun and wacky as “zombie, witch and vampire” time, but does indeed have its own merit and is admittedly my second favorite holiday. Maybe thats why I like the movie ‘The Nightmare Before Christmas‘ so much? At any rate, I can rhapsodize about how much I love Halloween all day long but that won’t get the frosting on the cupcake so lets move on. Halloween has its origins in the ancient Celtic festival known as Samhain (Irish pronunciation: [ˈsˠaunʲ]; from the Old Irish samain). The festival of Samhain is a celebration of the end of the harvest season in Gaelic culture, and is sometimes  regarded as the “Celtic New Year”. Traditionally, the festival was a time used by the ancient pagans to take stock of supplies and slaughter livestock for winter stores. The ancient Gaels believed that on October 31, now known as Halloween, the boundary between the alive and the deceased dissolved, and the dead become dangerous for the living by causing problems such as sickness or damaged crops. The festivals would frequently involve bonfires, into which bones of slaughtered livestock were thrown. Costumes and masks were also worn at the festivals in an attempt to mimic the evil spirits or placate them. The term Halloween is shortened from All Hallows’ Even (both “even” and “eve” are abbreviations of “evening”, but “Halloween” gets its “n” from “even”) as it is the eve of “All Hallows’ Day”, which is now also known as All Saints’ Day. It was a day of religious festivities in various northern European Pagan traditions, until Popes Gregory III and Gregory IV moved the old Christian feast of All Saints’ Day from May 13 (which had itself been the date of a pagan holiday, the Feast of the Lemures) to November 1. In the ninth century, the Church measured the day as starting at sunset, in accordance with the Florentine calendar. Although All Saints’ Day is now considered to occur one day after Halloween, the two holidays were, at that time, celebrated on the same day. Liturgically, the Church traditionally celebrated that day as the Vigil of All Saints, and, until 1970, a day of fasting as well. Like other vigils, it was celebrated on the previous day if it fell on a Sunday, although secular celebrations of the holiday remained on the 31st. The Vigil was suppressed in 1955, but was later restored in the post-Vatican II calendar. Now that is a magical holiday. I think because of the strong ties to ancient times theres really a special feeling about this time of year. Maybe thats just me, but I think they were on to something. Theres an electricity in the air this time of year and I don’t think its coincidental. Sure, I could’ve made the frosting taste like Ecto Cooler (which was sort of a citrus-fruit punch kind of taste), but I’m lazy. The carved pumpkin, lit by a candle inside, is one of Halloween’s most prominent symbols in America, and is commonly called a jack-o’-lantern. Originating in Europe, these lanterns were first carved from a turnip or rutabaga. Believing that the head was the most powerful part of the body containing the spirit and the knowledge, the Celts used the “head” of the vegetable to frighten off any superstitions. The name jack-o’-lantern can be traced back to the Irish legend of Stingy Jack,  a greedy, gambling, hard-drinking old farmer. He tricked the devil into climbing a tree and trapped him by carving a cross into the tree trunk. In revenge, the devil placed a curse on Jack, condemning him to forever wander the earth at night with the only light he had: a candle inside of a hollowed turnip. The carving of pumpkins is associated with Halloween in North America, where pumpkins were readily available and much larger, making them easier to carve than turnips. Many families that celebrate Halloween carve a pumpkin into a frightening or comical face and place it on their home’s doorstep after dark. In America the tradition of carving pumpkins is known to have preceded the Great Famine period of Irish immigration. The carved pumpkin was originally associated with harvest time in general in America and did not become specifically associated with Halloween until the mid-to-late 19th century. Particularly in America, symbolism is inspired by classic horror films, which contain fictional figures like Frankenstein’s monster and The Mummy. Elements of the autumn season, such as pumpkins and scarecrows, are also prevalent. Homes are often decorated with these types of symbols around Halloween. Okay I’ve babbled enough- on to the cupcakes! 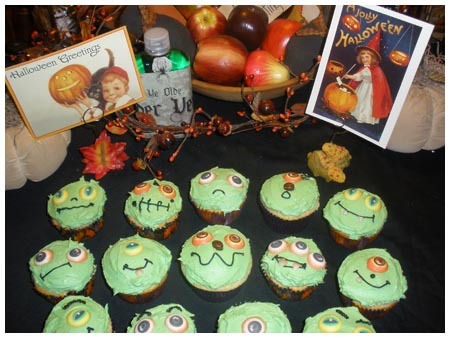 Oddly enough, before I even “met” Lyns, I was thinking of making cupcakes with eyeballs on ’em for Halloween. Of course, these eyeballs are way cooler than the ones I was thinking of using. 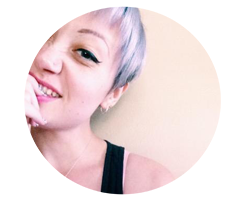 I’d also like to take this time to say that Lyns is an amazing person with an amazing story, and her store is filled with goodies that range from useful to just plain beautiful. 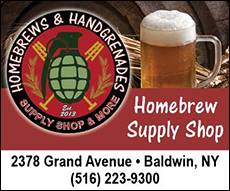 So please, get your asses over there and order lots of stuff from her! NOW! If desired, add a few drops of food coloring and mix thoroughly. (Use and store the icing at room temperature because icing will set if chilled.) 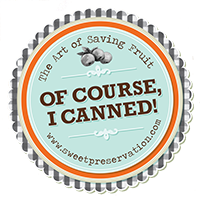 Icing can be stored in an airtight container for up to 3 days. Frost cupcakes with an offset spatula and put eyeballs on top. Ta-da! I recommend adding a bit of shortening to your frosting if you’re adding lots of color to it. It helps keep it stiff for piping. You could even omit half the amount of butter and for the rest, add an equal amount of shortening for a stiffer, droop-proof frosting, if you so desire. I’ve done that before and literally gotten mile-high frosting that resists drooping regardless of weather. And if you’re confused at the cupcake recipe ingredients, I suggest you buy a sense of humor. 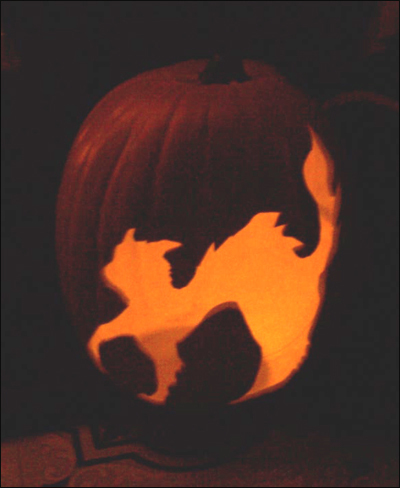 *Psstt… that kitty jack-o-lantern up there is mine, I carved it a few years ago. Previous Post Daring Baker’s Challenge: Pizza & toppings! 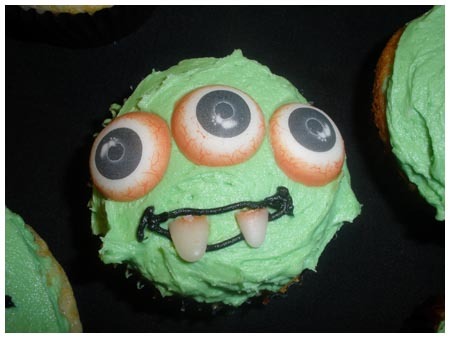 Pingback: Funny Halloween » Blog Archive » Cupcake Rehab - Slimer’s fright night gorey-eyeballs cupcakes. 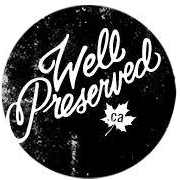 Pingback: Cupcake Rehab - Coop’s devilishly delightful cupcakes. 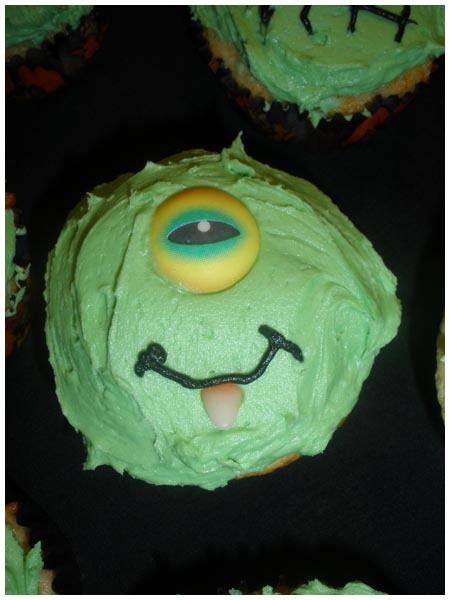 Your Green monsters are soo adorable. I am not sure I am supposed to think they are cute, but I do! 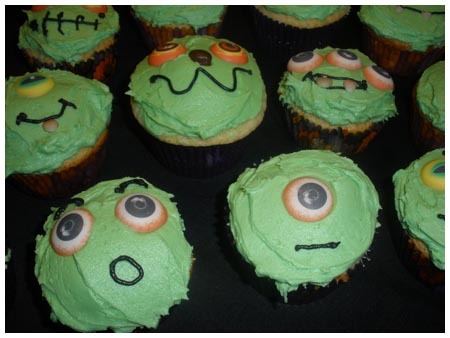 I have included them in our 25 Horrible Hairy Halloween Cupcake Idea post at Party Cupcake Ideas. the discussion. Usually it’s triggered by the fire communicated in the article I looked at. like they are written by brain dead people? 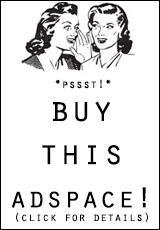 😛 And, if you are writing at other social sites, I would like to keep up with anything new you have to post.